Thread: What's Sig's Top-of-the-line 1911? I guess it is a matter of perspective. They have a top of the line in their own series of pistols. However, their series does top out at the point where Colt and Springfield really start to take off, so for 1911s as a whole, they are not the very top. 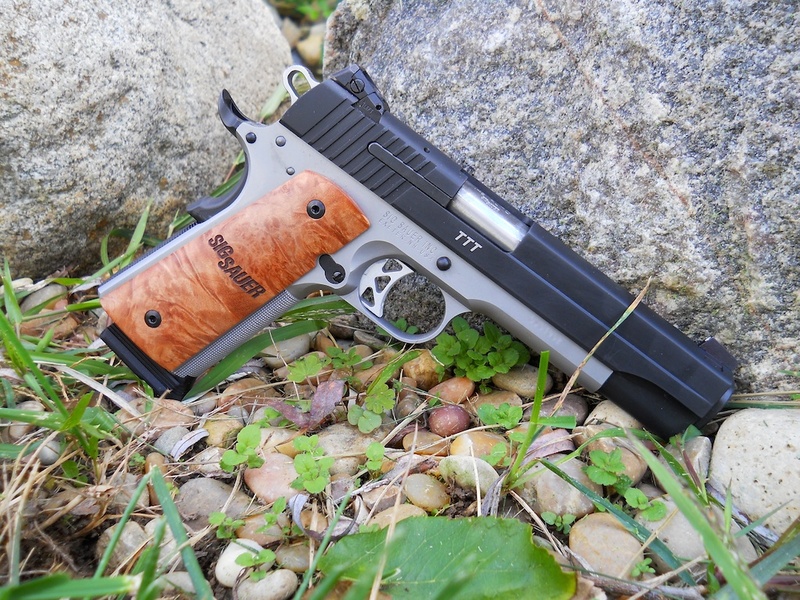 The Sig TTT is very nice and accurate with beautiful burl wood grips. The Top of the Line is either the Super Target or the Max Mitchel. I have the Super Target. This one is nitron which they no longer make. I enjoy the SIG 1911s. Depending on your price range, you should also consider Dan Wesson 1911s. Last edited by SIGWolf; 11th June 2017 at 09:11. I own the Nightmare Fastback and have owned the Nickel Rail. Both 100% reliable. Excellent firearms. Picked up the TACOPS last week... Not very interested in 'top of the line' pistols. You may want to check the DOJ approved list and then compare the models that you would be able to buy in CA. I purchased a Nitron 1911 a couple of years ago. This was the basic model and it came with night sights and adjustable trigger. It is very accurate but when Sig had a sale on 1911 22 conversion kits, I put the conversion on and left it as a 22. I plan to use it to qualify for my CCW in Nevada. Last edited by rds95991; 22nd January 2018 at 18:42. I like 1911s, I like to shoot 1911s, I like 1911s that shoot out of the box and I like to carry 1911s that I can defend myself with if/when needed. Of the 1911s that I own, four Colts, two in 45auto and two in 38Super have all been carried and I've used both calibers to defend myself...I like 1911s. I view 1911s from a working/protection viewpoint, along with S&W magnums, and I've come to really like the SIG emperor scorpion as a carry option. There's a lot of bang for the buck, especially with MIL/LE discounts...and SIG participates in MIL/LE discounts, for those who are looking for a Commander size, bobtail carry piece. Front strap is 30lpi, night sights (I've had three low light/night range sessions during the past month), G10 grips and ambi safety...for those times when switching hands. My Browning Hi-Power has an external extractor, as do many other designs, along with quality MIM parts, as do many other designs including magnum revolvers. There can be good and bad processes for making MIM parts, same goes for cast and forged parts. This SIG has digested everything from from SWCs to premium HSTs, Ranger Ts, Gold Dots and Golden Sabers; it's very accurate and split times can be pushed with different slide speeds do to different types of ammunition, from target to +P velocities. What's not to like, it works. "Never interrupt your enemy when he's making a mistake." I love the Sig TTT myself not top of the line but I believe it is the best value. The Sig TacOps 1911 is a direct Competitor to the TRP Operator! I have both and I believe that the Sig was put together better than my TRP and it saved me about 175 dollars when the time of purchase back in 2012 and also got a Free Sig 22LR 1911 thanks to a great promo they had at the time. My TRP Operator is a 2010 manufacture date and the only thing that it has over the Sig is the Series 70 non-Firing pin block that my Sig has but the Sig came with Tool Steel Cylinder and Slide Internals where the TRP has MIM parts. The Sig TacOps is the Same pistol as the one that Sig made and Marketed as the Blackwater 1911 except without the Laser Edged Bear Claw and the cool Wood Grips. I know this is an older post but I figure its always a good thing to pass on information. Check my recent thread in this forum, the range report on my Sig 1911 B XO CA. That's an entry level gun that impresses the **** out of me for its quality. If the cheapie is that good. . . . . . . . . . . . You can search the California roster at https://www.oag.ca.gov/firearms/certguns If the gun you want isn't on the roster the CalGuns website is the forum for finding a used one. All times are GMT -5. The time now is 00:55.